For many suburban Americans, the thought of migrating to a center-city environment holds an intriguing appeal, fueled by urbanists who tout the benefits of stunning cityscape views, walkability, proximity to civic and cultural amenities, and street vibrancy. I happen to be among those suburbanites who have harbored a secret fantasy of living in a dense downtown environment, replete with throngs of creative millennials roaming the streets, fancy coffee houses, and close access to fine dining. A decision to move from suburban Sacramento to Denver has been the result. The urban/suburban residential conundrum has generated epic debates that match the joys of city living against the benefits of suburbia. Terms such as “sprawl,” “drivable urbanism,” and the “slumming of suburbia” appear in the news regularly, often in an attempt to sway the pendulum in favor of dense city living. The tsunami of hoopla around “urban livability” has been of growing interest to my family and me as we prepare to relocate to Denver. I've come to believe the accuracy of the assertion, often voiced on this site, that America’s interest in suburbia has not abated. It has become abundantly clear from the brisk interest of potential buyers of our current Folsom, California residence, that living in a suburban locale still holds a special appeal. The environmentalist clamor aside, what people really want from a community is amenities that appeal to their specific interests. Folsom, a city of 72,000 nestled on the outskirts of Sacramento, offers myriad advantages for leisure — such as boating and biking — to basic requirements like low crime rates and quality schools. For us, the move to Denver is a transition from suburbia that's been a challenge. Despite steady buyer interest, our 3100-square-foot house is still on the market. Suburban critics, like Urban Land Institute-fellow Christopher Leinberger, would likely cite a potential cause as being declining interest in what are affectionately known as McMansions, those big cumbersome houses replete with big lawns, big mortgages, and big utility bills. Demographic trends also show a steady rise in the number of adults without children, who are presumably less likely to purchase a big house. And, as a real estate professional pointed out to us, people are holding out for a windfall deal these days amid the abundance of foreclosures in the Sacramento metro area. Finding a family home in Denver has been even more interesting. While the downtown Lo-Do District has great appeal to us because of its vibrancy, civic amenities, and proximity to Coors Field (Rockies Baseball), Invesco Field (Broncos Football) and the Pepsi Center (Nuggets Basketball and Avalanche Hockey), it simply doesn’t strike my wife and me as the ideal environment for raising our seven-year-old daughter. The questionable schools in the city-center core were the deal breaker, and the catalyst for our decision to explore quasi- suburban areas on the fringe of downtown. As is the case with many downtowns across the country, real estate values in central-city Denver have taken a severe beating. With tepid demand, large inventories of condos have sat vacant for months, leading some developers to convert them into rentals. After several exploratory trips and careful consideration of our options, particularly since our house in California is still on the market, we elected to rent in a neighborhood called Cheeseman Park. An eclectic, diverse enclave just on the outskirts of downtown, the area offers the hybrid urban/suburban environment that we were seeking. It also has a top-notch elementary school for our daughter. Our choice of location within the Denver area seems to support a national trend that was much discussed at the recent Urban Land Institute Summit/ Spring Council Forum in Boston; namely, that the vast majority of population growth in U.S. urban regions will occur not in downtown cores, but in suburbs, and of those, most notably the close-in suburbs exuding an urban feel. This is something that leaders in our current home region of Sacramento failed to grasp recently. The City Council made the decision to pursue a mixed-use project with 256 housing units in the downtown core, over a more ambitious proposal outside of downtown featuring a complex with live music, a year-round farmer’s market, and a venue showcasing California’s rich agricultural history. The choice seems ill-advised, since previous downtown housing projects have failed, in part due to tepid residential demand. In the end, urban living has its benefits, although decisions to reside in a denser environment should be sprinkled with a dose of pragmatism. The large population is one factor that maintains Denver’s robust spectator sports scene, which is a huge draw for me personally. And, like many bigger cities, it also offers a wider selection of social and cultural activities than that of the Sacramento region. While urban housing has captured the imagination of many Americans, downtowns may be best suited for the role of civic and cultural centers – places that people come to visit, rather than where they reside. 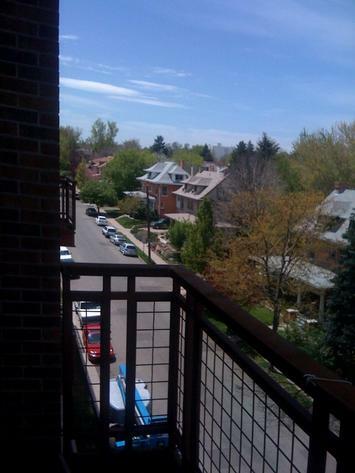 Photo by Michael Scott of a "suburban" neighborhood in Denver. Michael P. Scott is a Northern California urban journalist, demographic researcher and technical writer. He can be reached at michael@vdowntownamerica.com. Submitted by urbanist10 on Thu, 08/05/2010 - 17:39. Submitted by davebarnes on Wed, 08/04/2010 - 20:22. Rent in the Bromwell Elementary school district. Bromwell is an upper-class private school within DPS. Submitted by urbanist10 on Thu, 08/05/2010 - 17:45. Great to hear from you again. I very much appreciated your insights about the Denver area when we chatted by phone several months ago. As it turns out Bromwell Elementary is actually my daughter's assigned school. We are within the district boundary in Cheesman Park. Let's connect for lunch sometime. Submitted by rencelas on Wed, 08/04/2010 - 20:10. I'm confused. You seem to differentiate between an urban environment (that is, in a city) and a suburban environment. You refer to your neighborhood as a hybrid, but from a quick google map of the area, it appears to be wholly urban. No, it's not high rise living, but it's not even remotely suburban, other than single family homes. Submitted by davebarnes on Wed, 08/04/2010 - 20:24. Did you fail 8th grade math? Submitted by rencelas on Sat, 08/07/2010 - 18:21.